BEKILY, Madagascar, Jun 14 2016 (IPS) - Havasoa Philomene did not have any maize when the harvesting season kicked off at the end of May since like many in the Greater South of Madagascar, she had already boiled and eaten all her seeds due to the ongoing drought. Here, thousands of children are living on wild cactus fruits in spite of the severe constipation that they cause, but in the face of the most severe drought witnessed yet, Malagasy people have resorted to desperate measures just to survive. “We received maize seeds in January in preparation for the planting season but most of us had eaten all the seeds within three weeks because there is nothing else to eat,” says the 53-year-old mother of seven. She lives in Besakoa Commune in the district of Bekily, Androy region, one of the most affected in the South of Madagascar. The U.N. Food and Agriculture Organisation (FAO) says that an estimated 45,000 people in Bekily alone are affected, which is nearly half of the population here. 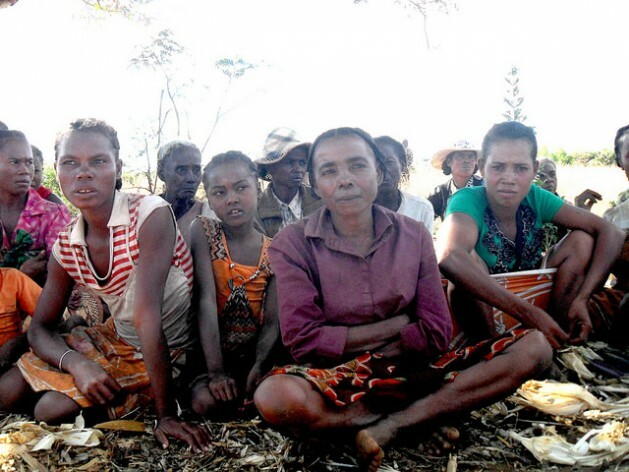 Humanitarian agencies like the United States Agency for International Development (USAID) estimate that 1.14 million people lack enough food in the seven districts of Southern Madagascar, accounting for at least 80 percent of the rural population. The United Nations World Food Programme now says that besides Androy, other regions, including Amboassary, are experiencing a drought crisis and many poor households have resulted to selling small animals and their own clothes, as well as kitchenware, in desperate attempts to cope. After the USAID’s Office of U.S Foreign Disaster Assistance through The Adventist Development and Relief Agency (ADRA) organised an emergency response in January to provide at least 4,000 households in eight communes in the districts of Bekily and Betroka with maize seeds, many families had devoured them in less than three weeks. Due to disastrous crop production in the last harvesting season, many farmers did not produce enough seeds for the February planting season, hence the need for humanitarian agencies to meet the seed deficit. Farmers like Rasoanandeasana Emillienne say that this is the driest rainy season in 35 years. “I have never experienced this kind of hunger. We are taking one day at a time because who knows what will happen if the rains do not return,” says the mother of four. Although the drought situation has been ongoing since 2013, experts such as Shalom Laison, programme director at ADRA Madagascar, says that at least 80 percent of crops from the May-June harvest are expected to fail. The Southern part of Madagascar is the poorest, with USAID estimates showing that 90 percent of the population earns less than two dollars a day. Against this backdrop, the U.S. ambassador to the UN Agencies in Rome (FAO, IFAD and WFP), David Lane, has urged the government to declare the drought an emergency as an appeal to draw attention to the ongoing crisis. “Climate change is getting more and more volatile but the world does not know what is happening in Southern Madagascar and this region is indicative of what is happening in a growing number of countries in Southern Africa,” he told IPS during his May 16-21 visit to Madagascar. According to the UN Office for the Coordination of Humanitarian Affairs (OCHA), these adverse weather conditions have reduced crop production in other Southern African nations where an estimated 14 million people face hunger in countries including Southern Angola, Namibia, Botswana, Zimbabwe, Lesotho, Malawi and South Africa. Thousands of households are living precarious lives in the regions of Androy, Anosy and Atsimo Andrefana in Southern Madagascar because they are unable to meet their basic food and non-food needs through September due to the current El Niño event, which has translated into a pronounced dry spell. “An appeal is very important to show that the drought is longer than usual, hence the need for urgent but also more sustainable solutions,” says USAID’s Dina Esposito. She says that the problem with a slow onset disaster like a drought as compared to a fast onset disaster like a cyclone – also common in the South – is to determine when to draw the line and declare the situation critical. Esposito warns that the worst is yet to come since food insecurity is expected to escalate in terms of severity and magnitude in the next lean season from December 2016 to February 2017.